In my childhood, and of course long before that, the seventh day, or Sunday as it became, was a day for rest. I well remember the silence of Sundays growing up in the North East. Everything was shut, shops, museums, places to visit, just about everything, except churches of course which, as a family, we never visited when a service was being held. My Godfather was a staunch Christian and I think he never ever forgave me for a failure on my part to be confirmed into the Church of England. I wasn’t against the idea, but as a teenager interested in other things, it never entered my head, and as such although I know he now lives in Norwich, I know absolutely nothing about him. As a child I think Sunday used to last for about 3 weeks. Boredom and I are constant companions. I need to be stimulated at all times and Sundays of old were not stimulating. The silence which seemed to envelop Sundays also seemed stifling. My bedroom overlooked the 1st green of Boldon Golf Club in County Durham. I’d be reduced to spending hours watching golfers playing on the course, not the most exciting thing to do. Sometimes I’d wander out and sit on the fence and watch them, which occasionally got me into hot water from my mother who has the propensity to see errant danger in the most innocent of pastimes; so of course she visualised me being felled stone cold dead by a golf ball. Mind you our front room had a huge bay window overlooking the course and many is the time we have been alerted to a wayward projectile through the window by an almighty crash. But I think on balance I miss Sundays as they were, but I’m not actually sure what or why I miss them. Clive Aslet writing in the Daily Telegraph wrote at length about this in March by asking the question “Whatever happened to Sundays?” It was interesting that a grocer’s daughter, in the guise of Margaret Thatcher, first broke into the sanctity of Sunday. Since 1986 and the initial relaxation of the Sunday Trading Laws, there has been a gradual drip drip erosion of the one day in the week many people, and I am one of them, feel should remain special. This year during the Olympics, full relaxation of Sunday Trading Laws will be rolled out. Why? What has shopping and sport got to do with anything? Well of course both are big business, but I personally do not see the relevance of making shopping even easier just because Britain is hosting the Olympic Games. And what about the people who will be working on those Sundays, do they not wish to see the Olympics too? Sundays as they were were boring, that I have to admit. But looking back from the great height of my middle aged opinionated blogging, there was something special about a day when everything stopped, people could spend time with the family (with associated health warnings of being in a confined space with Aunt Maude) and just relax. After all this was the original meaning of Sunday, we work hard 6 days a week and then relax, properly relax on the 7th Day. Now we seem incapable of relaxing. Sundays have become either a mad dash to the local supermarket, often to buy so much food we end up having to throw most of it away, or a mad dash to the DIY out of town shopping store to buy a BBQ we never need so we can spend quality time with the family; but in the chaos of getting to and from the DIY Superstores Maddening Crowd, we’ve become too tired to even light the charcoal, and of course it is now raining, so everyone has gone indoors to watch TV. The brilliant film “Whisky Galore” based on the book by Compton MacKenzie which itself was loosely based on the sinking of the S.S. Politician, encapsulates the power Sundays once had in society. If you do not know the film, a ship packed with whisky runs aground off the Hebridean island of Eriskay. Eriskay itself due to World War 2 rationing has run dry of whisky. A calamity so enormous to the islanders they’d go to great lengths to rectify the situation by hatching a plan to ‘relieve’ the ailing ship of its cargo. About to set off, the clock strikes midnight – THE SABBATH. No one can work on the Sabbath and so the whole enterprise stops for 24 hours; even if their drive for the uisge beatha (pronounced 'wishge ba' ) the ‘water of life’, brings them almost to insanity during the enforced wait. However I must finish my thousand words for the day because as I look out of the window, Julie is just driving up the drive after a mad dash shopping trip for food and I am in the middle of decorating so must head of now to the DIY store for another pot of paint. Saturday morning: I was going to write this at Cobb’s, the local farm shop near Hungerford, but with one thing and another it is 09.30am and I’ve just got up. Foregoing therefore the writer’s indulgence of sitting in the farm shop with my laptop writing this, whilst munching my way through a Farmhouse Breakfast (sausages to die for), drinking gallons of coffee and observing the good folk of Berkshire, I am at home. Hot fresh granary toast from the village bakery at Great Bedwyn, smothered in thick Seville marmalade and a mug of Taylor’s coffee beside me. All is calm here as I look out of the window at the weather outside. A bit breezy maybe but enough blue sky to make a sailor’s breeches, as the old saying goes. It is hard therefore to appreciate the news this morning. As I write this, Northern England, Ireland and Scotland are being battered once again by 2012’s unseasonably wet and stormy weather. To date over 70 severe flood warnings are in place and yet again the horror of being flooded out is being re-enacted by people, with predictions of 4 inches of rain in 24 hours in some areas. Being flooded out must be one of the worst things that can happen to any household. Within seconds a lifetime’s memories can be washed away or contaminated by thick oozing floodwater. Pictures of the devastation that befell Boscastle in Cornwall in August 2004 are still vivid in my memory. Boscastle of course rebuilt itself, but it is not the same place. The atmosphere changed forever in just a few small hours. In July 2007 Tewkesbury in Gloucestershire was badly flooded as the River Severn in full spate met the River Avon and the incoming tide from the Bristol Channel 20 miles downstream. Having nowhere for this massive volume of water to go, severe flooding took place. TV images of the 12th Century Abbey, built on high ground and remaining dry but surrounded by water beamed around the world. That flood was caused by 5 inches of rain falling in the hills beyond Tewkesbury in as many days. In March 2008 I went to a concert at the Roses Theatre in the town and what shocked me as I drove into the town from the M5 motorway was the number of caravans parked on people’s driveways. A full 8 months after the floodwaters had receded, the lives of individual people were still being adversely affected. But flooding in summer, no matter how dreadful it is to those affected, is something which happens regularly. A quick look back through some weather records show severe floods in July 1968 affecting much of the South East, and of course the Wimbledon tennis championships are prone to disruption by rain, the worst affected year being 1922 when it took 3 weeks to finish the tournament due to rain. The Boscastle floods themselves were not exceptional, with the severe and more widespread floods of 1847 causing more, but less reported, damage in that area. In this country we like to think that summers are long and hot, lazy days sipping iced tea while snoozing in the warm sunshine ostensibly watching a game of village cricket. Actually this is far from the case and actually more of the exception than the rule. Being at the edge of Europe, Britain is wet. Our weather is officially classified as ‘temperate maritime climate’. In simple terms we have a lot of wet sea to our west, a lot of dry land to our east and we sit on the boundary. This is what makes our weather unpredictable and annoying for lovers of hot sunshine in the summer or deep, crisp and even snow in midwinter. Daily there is a battle going on between the dominant moist Atlantic air arriving over us from the South West winds and the dry air from the East. Coupled with this at this latitude we should have a climate similar to Canada, hot summers, very cold winters and 2 weeks of spring or autumn in between. The Gulf Stream of course stops this happening by continuously flowing warm air over our shores from the Caribbean. There is of course the North American, Atlantic Hurricane season, which begins in June and lasts until November, although this year Tropical Storm Beryl hit landfall in late May. Many of these hurricanes never make it across the Atlantic, but a fair number do. They may have lost some of their intensity on the 3,000 mile journey but they reach Britain laden with moist air between 3-5 days after leaving the east coast of America. Not all of these low pressure systems bring rain or flooding, in fact most just bring turbulent unsettled air over our shores. But again Britain being positioned where it is, we are on the roller-coaster of weather patterns. Much has been said already about this cold and wet season and its effects on wildlife at the height of the breeding season. Certainly there have been disasters. The Ouse Washes were flooded, as were the Somerset Levels at peak ground nesting bird season. High winds in May did blow rook chicks out of the nests causing breeding failure for this year. Up on the Farne Islands huge waves battered the south cliffs where many seabirds were nesting. Butterfly and moth numbers are also down on a normal year. But this is the point. In Britain we never have a normal year, despite what the media and product advertisers will tell you. Wildlife by and large is well adapted to our unpredictable climate and will recover. We will have long hot summers, we will have wet cold winters, and we will have everything in-between. What we cannot predict is the weather and this is what makes Britain a unique place to live in. Although I may have left the house on a hot sunny morning, by afternoon I could be enjoy the sound of raindrops quietly tapping their beat onto the leaves of trees. But what clothing I should wear for a typical summer’s day, is a bit of a Lucky Dip. What is it about a view that takes the breath away? There is something in our make-up which, when we come upon a view, makes us stop and look far off into the distance. I do not know anyone who does not like to look at a view, whether that is an urban landscape or atop a hill looking down to the valley below. Another must visit place for taking in a view is at the seaside, where we can spend hours just sitting on the beach gazing out to sea. This just may be the reason for our wish to see and to spend hours just looking at a view. Is it the view we are looking at; or the far horizon? We may think of ourselves as modern man, but actually we are ancient, at least the physiognomy of our bodies and genes are. I recall reading somewhere that our gut flora is designed for a lifestyle 50,000 years ago, essentially a diet of the hunter gatherer, seeds, nuts, roots and fish and then a very occasionally a good blow out on a woolly mammoth or two. So in my mind, if we have 50,000 year old stomachs, surely the rest of us must be that old too. Certainly after a few glasses of grape juice the night before I can wake feeling that old. But mulling over why we like to look at a view the other day it struck me that we are not so much looking at the view, but our genetic structure is looking for danger or prey on the far horizon? It sort of makes sense. In the times of the hunter gatherers people would have found a good vantage point and scanned the horizon looking for the woolly mammoth to bring home to the roaring fire. They could of course stand in grassland and have a look, but on high ground the hunter could see much further than his rival. And of course standing on top of the hill allowed him to also spot his enemies, well before they saw him. I’m no expert but I can’t think of any ancient fort, castle or defended position that isn’t on high ground, well apart from that one in Monty Python that kept falling down into the swamp. But that aside, it made absolute sense to build defences on high ground, partly as they were easier to defend as the enemy was exhausted running up that hill, but it also meant the owner of the fort had a clear view all around; to the horizon! The seed of this idea came from someone asking me the other day where I liked best in Britain. 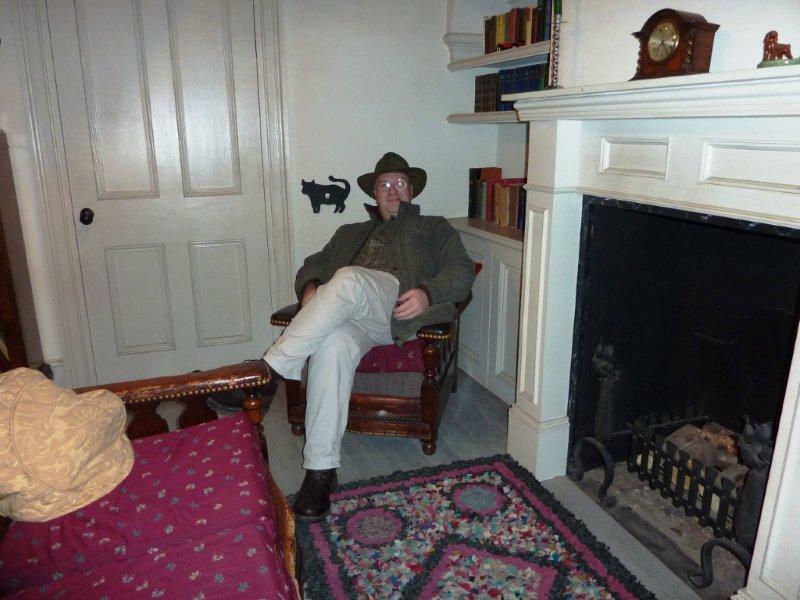 That was easy to answer; I have two places I love to visit as often as I can one in Northumberland and one in Dorset. The first is overlooking the River Coquet near the hamlet of Hepple, and the second is the view I absolutely love from Eggardon Hill in West Dorset, looking down past Askerswell and to Golden Cap, 10 miles or so away. Apart from both being in England, what connects these places is that they provide a view of a wide landscape as seen from a high vantage point. I can sit for hours at each place just doing absolutely nothing. But actually am I subconsciously looking for danger? This got me thinking, where else have I loved to stand still and stare off into the distance? From the holy island of Lindisfarne, looking across the sea to Ross Links beach. From the Stiperstones in Shropshire looking across to Wales or the Long Mynd. From the cliffs at Lizard Point, not the one on Cornwall, but the one in Tyneside, looking north along the North Sea coast to Newbiggin-by-the-Sea in Northumberland and as far south as Whitby in North Yorkshire, an impressive 80 miles. In the built environment I love to look out of high places. Church towers are an easy and obvious example. The London Eye is another. Before going on the Eye for the first time I bought a 360 degree panorama guide to, yes the far horizon surrounding London. So here it is again, the horizon is ever present even in our most densely urbanised Capital city and it is impressive that even as sprawling as London is, at that height, green fields and hills can still be seen in all directions, on the far horizon. In cultural terms, especially in the visual arts, it is the landscapes of far reaching views which can make painters go weak at the knees. Paintings such as El Greco’s, View of Toledo, captures this mood beautifully by recreating the mood of a hilltop town from a high vantage point. Many a landscape painter or photographer even positioned on the shores of a lake has painted or photographed not the immediate shoreline but the landscape ahead of him or her all the way to the mountains and the skyline in the distance. Even when incarcerated indoors for long periods, artists crave the distant view. One such evocative painting is by Vincent van Gogh. In his painting of the view he had from his asylum, The Starry Night, he longs for the distant town, hills and sky which for the moment is out of his reach. But there is one thing about a view to the far horizon, much like the sight of a rainbow, which is impossible to resolve. No matter how much we may look, no matter how far we may travel, we can never ever reach the horizon. We are surrounded by views to the horizon, but we can never touch or feel that ephemeral object. The horizon is only in our mind. Logically we know beyond the horizon is another place, we just can’t see it. And just maybe this is why we will sit for hours on a beach looking at the sea, because deep down we are wary of what is over the horizon, beyond what we can see. “….I am standing on the sea shore. A ship sails and spreads her white sails to the morning breeze and starts for the ocean. In starting this challenge to write 1000 words a day while on a two week holiday, I thought I’d steer clear of writing about wildlife. Not that I had become weary of wildlife, far from it. 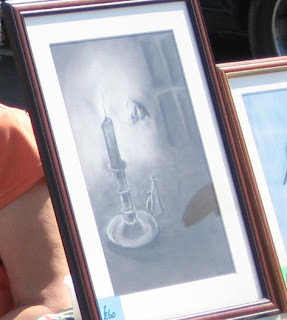 It was more that the reason behind this challenge was to provide discipline and structure to my attempts to write; to develop an ability to write about anything that came into my head upon first waking. However an interesting observation is that many of my first waking thoughts began with the letter W; Walking, Wind, [walking] sticks; [writing] Mills and Boon. Undoubtedly a psychiatrist would make a reasoned study of this obsession with the 23rd letter of the English alphabet. However today I mean to turn my ideas of not writing about wildlife around, as well as turning the W thought’s of the week about, to begin today’s 1000 words with the letter M: Midsummer’s Day. At 04.52 British Summertime today, it was officially the Summer Solstice. I’ve written about my love of both the summer and winter solstices before on this blog. There is something to embrace, that constant turning of the Wheel of the Year, which we as sophisticated humans can neither control nor affect. For millennia our Planet has revolved around the Sun, and so each day either lengthens or shortens. This makes no two days the same and that uniqueness of daylight length is a fascination to me. The arrival of the Summer Solstice is a pivotal moment in the 12 month cycle, but unlike the Winter Solstice, which I find universally uplifting, I find the Summer Solstice both uplifting and sad. I love these long days. Here as I write in Wiltshire it becomes light by about 4am and twilight still covers the sky at 11pm. Of course further north, in places like Shetland for a few weeks it will never really become dark at all. I recall watching otters on the Isle of Skye at midnight one Solstice evening. Sitting on my own on a coastal headland, I watched those otters playing and feeding amongst the kelp beds, as clear to me as if it had been full sunlight. The summer solstice though can make me feel sad because, imperceptibly at first, I know that from today the daylength will begin to shorten and autumn then winter are ahead of me. I think this melancholic side must be due to my Scandinavian genes; the Nordic countries do make the most of the summer daylength, knowing that in a few months darkness will dominate their lives for the long winter ahead. 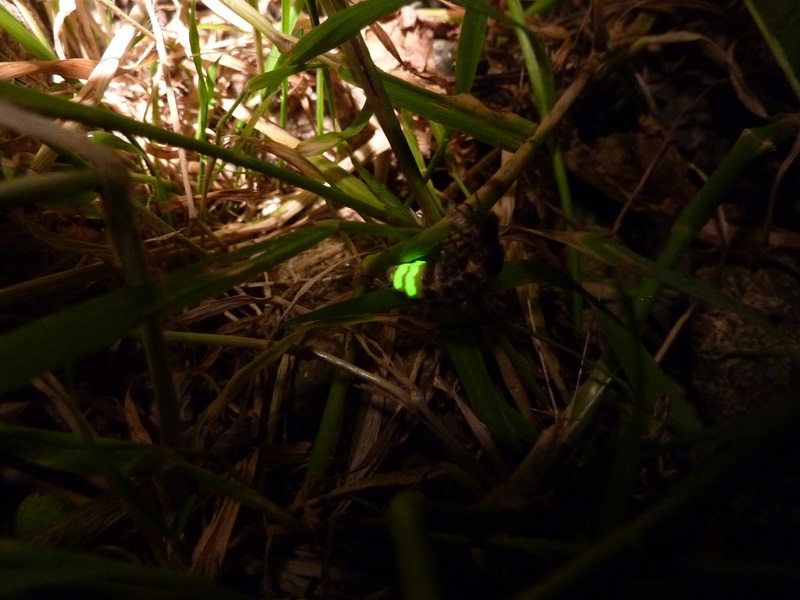 But this year as the days lengthened in early June I set myself another quest, that of seeing a glowing glow worm. In all my years of wandering about the countryside I had never seen a flightless glowing female advertising herself to a passing flying male. It is thought that glow worms are in decline nationally, although this may possibly be more a result of increasing light pollution causing their admittedly very bright light to be dulled and hard to see by anyone looking for them. In dark areas of the countryside, the female glow worm light is so bright it can easily be seen 20 meters away. And so it was that last night on the night of the Summer Solstice, Julie and I set off to look for glow worms. I’d found a single female glowing the night before and intended to return to look for more. Before that we drove to a disused railway line at Wootton Rivers on the edge of the vast Savernake Forest. There have been historical reports of glow worms here and so with anticipation of seeing one we headed off down the railway line. It was 10 o’clock and there was still enough light to see the banks of this track were covered in wild flowers. Moths too danced about in amongst the shrubs, it was good to see them as this year has not been kind to moths and butterflies. Suddenly I heard a noise and there right in front of us, a black and white striped face, a badger, just three or 4 feet away. I’m not sure who was the more startled. I called to Julie behind me but in doing so this gave old Brock enough time to disappear into the undergrowth. After walking a good length of the railway we had not seen any glow worms, so we returned to the car and drove to Great Bedwyn. Driving around the empty lanes here in rural Wiltshire often brings us closer to wildlife. Near Crofton a polecat (or maybe polecat x ferret) ran across the road in front of the car towards a rabbit, but, seeing the car, turned and ran into the hedge. These mustelids with their ‘Lone Ranger’ mask are becoming quite common around here I believe and recently I found one dead by the road near Pewsey. If that wasn’t enough, as we arrived at the railway footpath crossing, the car headlight picked out a barn owl, which again seeing the car approach flew off. About a quarter of all glow worm sightings are along railways or tracks and so as we got out of the car and with caution quickly crossed the main Plymouth to Paddington railway line, there in the same spot as the previous night, a bright green glow, the size and intensity of a L.E.D light on a hi-fi. 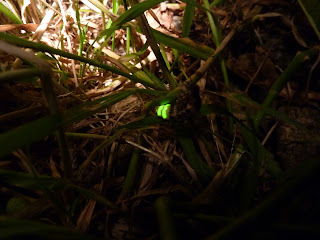 Julie, like me, had never seen a glow worm until last night and, despite being gripped by hayfever, we were both mesmerised while I took a photograph. Returning to our car, I looked along the railway line. There not 20 feet away another glow by the side of the track. In dark areas like this they really do stand out and there may have been more, but this is a very fast line and it would be foolhardy to trespass, so I observed from the comparative safety of the footpath crossing. But I shall remember this Midsummer’s night, looking for, and finding, glow worms in Wiltshire, a priceless memory for me as the days imperceptibly begin to shorten.